Lutherans march during the National Council of Churches Act Now Rally to End Racism on the National Mall on the 50th anniversary of Martin Luther King Jr.'s assassination. Following the April 4 “Act Now: Unite to End Racism” rally in Washington, D.C., ELCA Presiding Bishop Elizabeth Eaton issued a statement recommitting the ELCA “to work for racial justice and inclusion, to work against white privilege, and to be a church that truly welcomes all.” Eaton joined ELCA members and ecumenical and interreligious partners from across the country for the rally, held in commemoration of the 50th anniversary of the assassination of Martin Luther King Jr.
More than 30,245 participants and nearly 1,000 volunteers will travel to Houston June 27-July 1 for the 2018 ELCA Youth Gathering. ELCA Presiding Bishop Elizabeth Eaton and Nadia Bolz-Weber, an ELCA pastor and author, will be among those speaking. Youth will have opportunities to worship, study God’s word, serve and have fun together under the theme “This Changes Everything” (Ephesians 2:8). Two pre-events, the Multicultural Youth Leadership Event (MYLE), for youth of color or whose primary language is other than English, and The tABLE, for youth with disabilities, will be held June 24-27 in Houston. Watch Living Lutheran’s Facebook page this June for a preview of event coverage and look for the full stories in the September issue. 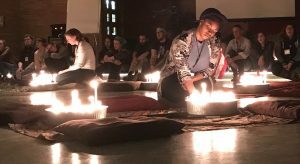 Ashley Holbert (right) and other Young Adults in Global Mission volunteers light candles and pray during a contemplative worship service during the YAGM “Discernment-Interview-Placement” event. The ELCA Young Adults in Global Mission (YAGM) “Discernment-Interview-Placement” event was held April 13-15 in Woodstock, Ill. Eighty-five young adults participated in workshops, conversation, worship and prayer to discern a call to service through YAGM. Those who accept the call will leave in August for a year of service alongside ELCA companions in one of 11 country programs. The YAGM program invites ELCA young adults ages 21 to 29 into a transformative, yearlong journey in international service. The ELCA Church Council met at the Lutheran Center in Chicago April 5-8, convened under the framework of ELCA Future Directions 2025. In her report, Presiding Bishop Elizabeth Eaton emphasized that the work of the churchwide organization, including that of the council, is guided by “ways to live into and implement the … goals that we set as a church together in Future Directions 2025.” Related to the fifth goal of being “a well-governed, connected and sustainable church,” the council approved a poposal from the board development committee to create an ELCA governance policy manual. In 2013, the ELCA Church Council appointed the Entrance Rite Discernment Group to consider the question of the entrance rite for the roster of Ministers of Word and Service and to bring a recommendation to the Church Council for action by the 2019 Churchwide Assembly. In March and April of 2018, the group presented its proposed recommendations. Final recommendations will be sent to the Conference of Bishops and Church Council this fall. A new Pew Research survey finds that one-third of Americans—both those who say they believe in God and those who say they don’t—trust in a higher power or spiritual force. But only a slight majority—56 percent—say they believe in God as described in the Bible. Evangelical Christians and black Protestants had the highest rates of belief in a God of the Bible—91 and 92 percent respectively. That number falls to 72 percent among mainline Protestants and 69 percent among Roman Catholics. ELCA Advocacy’s work is part of many ministries of the church, and high school students attending the ELCA Youth Gathering this month will experience that firsthand in the Interactive Center. For AMMPARO (Accompanying Migrant Minors with Protection, Advocacy, Representation and Opportunities), ELCA Advocacy will provide an interactive experience of the migrant journey. Gathering participants will learn more about what drives displacement of young people, and what they face during the journey and in U.S. communities. At the end of the journey, they will learn how advocacy can help protect young people who must flee their homes. ELCA Advocacy is also partnering with Lutheran Outdoor Ministries to connect youth and leaders with how they experience God’s creation at camps and retreat centers. They will be reminded of the restorative power of spending time in nature and, through video, will discover how climate change affects creation. Participants will then learn how to connect with policymakers to share their voice in advocating for protection of the planet. Along with ELCA Young Adults ministry and the ELCA Strategy on HIV and AIDS, the advocacy unit will help participants learn about living out their faith through intersections of purpose, witness and community. 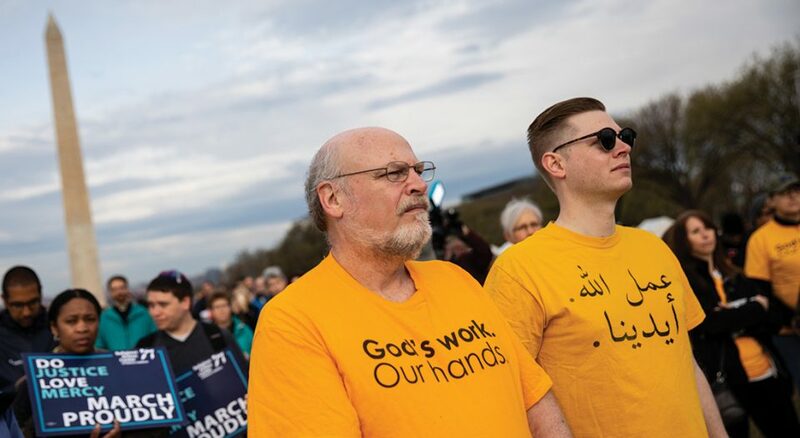 Through these interactive experiences, participants will see how ELCA Advocacy connects faith with public life to promote peace and dignity for all and to defend God’s creation.